I'm kinda late to the party with this collection. It's still fall though! 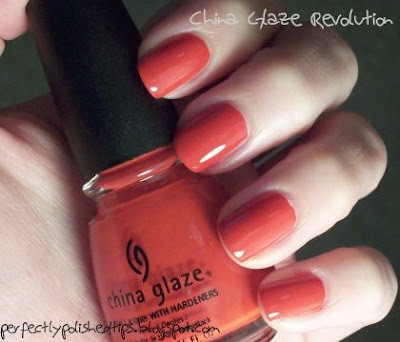 China Glaze released Operation Color for fall 2008. I personally felt like these colors would have been more appropriate for a spring collection but I really like them. As I've mentioned before I love almost every polish with a creme finish. Combine that with hues of blues and purples and I'm hooked. I didn't have any application with these polishes and even though my pictures show two coats of color I have a visible polish line, so in the future I would use three coats of color. Secret Peri-wink-le is a pastel periwinkle creme. The color shown in the photo is pretty true to life. 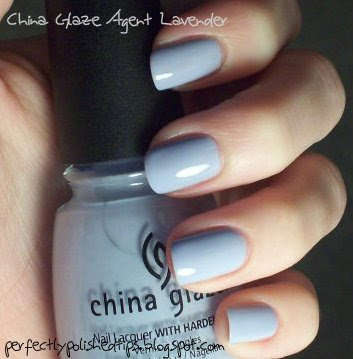 Agent Lavender is a delicate lilac creme. I hate how my camera likes to assume anything light colored is white. The color is more intense and less blue. Every since I wore Zoya Miley I fell in love with all lavender and lilac colors. They are so clean and lady like. Pink Underground is a pepto bismal-y pink with subtle pink shimmer. A year ago I would have been all over a color like this now not so much. Believe it or not though I don't have anything similar in my stash. 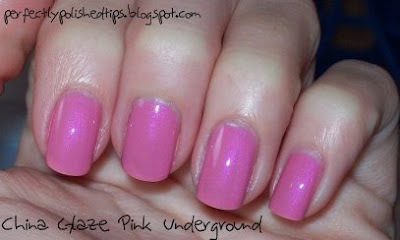 Here is Pink Underground with flash to show the subtle shimmer. Revolution is a tomato red creme. I had to alter it a bit to actually make it look like the polish. The picture is pretty close, it's a bit brighter in real life. This red applied very nicely but I just don't do red as much as I used too. This collection has two more colors as well; Code Orange, and Golden Opportunity. I don't do yellow or orange so I don't have those to show you. I know a lot of the other blogs have posted swatches though so you should be able to find them easily if you're curious! I'm in love with creme shades myself and I have to say that my revolution isn't as muted as the one you've pictured. It was ALOT redder, and not really one of those Reds with a blue base (think OPI "Thrill of Brazil" types). I love the first two colors. I'm on a lavendar kick lately.